Starting in 1942, 157 aircraft were built to Do 217J-1 and Do 217J-2 standard; the former was a fighter-bomber, with a nose similar to that of the Do 17Z-1 0, housing four 7.92 mm (0.31 in) MG 17 machine-guns and four 20 mm (0.78 in) MG FF cannon, in addition to the dorsal and ventral positions each with a pair of 13 mm (0.51 in) MG 131 guns; the Do 217J-2 was a night-fighter with 20 mm MG 151/20 cannon replacing the MG FF weapons of the Do 217J-1 and fitted with FuG 212 Lichtenstein BC radar. 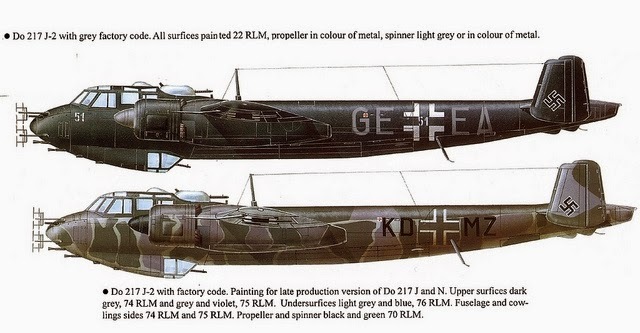 Conversion of the Dornier Do 17Z bomber into a long-range intruder and heavy night fighter followed the Luftwaffe's realisation in 1940 that the RAF was beginning a determined, if rather haphazard, night bombing offensive against Germany. Thus, the experimental three-seat, twin-engine Do 17Z-7, code-named Kauz (Screech- Owl), was produced to trial the idea. The former bomb-aimer's position in the nose was replaced by a solid fairing accommodating three 7.9mm MG 17 machine guns and one 20mm MG 151 cannon. Flight-tests proved the modification would work in spite of the aircraft's size and nine Z-10 Kauz IIs followed, each with an armament of four MG 17s and two MG 151s. These were delivered to 2 Staffel of Nachtjagdgruppe 1 formed on June 28, 1940. Fitted with the early FuG 202 Lichtenstein airborne radar and a Spanner infra-red searchlight, the third conversion was a Do 215B-5, named Kauz III. This was in use until mid-1942 when the larger, more powerful Do 217J-1 arrived with 4./NJG 1. 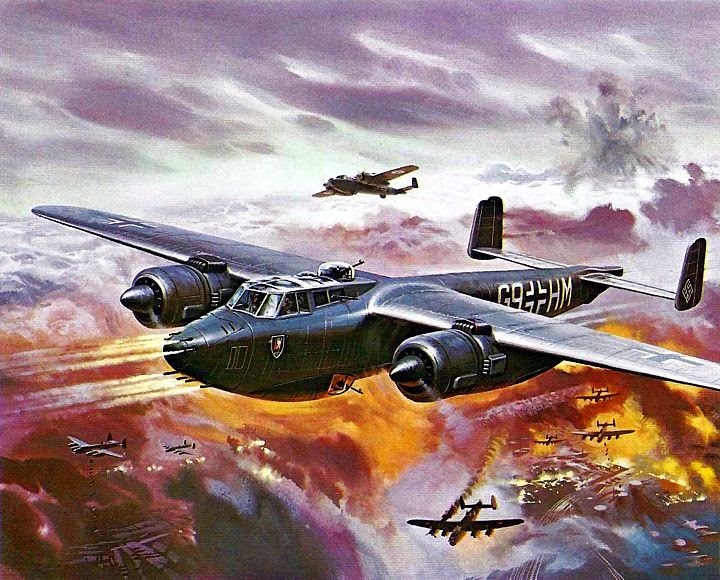 The prototype of this fi­ghter conversion of the Do 217E-2 bomber few in late-1941 and with a formidable armament of four 20mm and four 7.9mm guns, great hope rested on its arrival in service. Hope turned to despair when the crews experienced the type's poor maneuverability, insufficient power from the BMW 801 engines and that old problem which plagued a number of German designs, a weak undercarriage. While Ju 88s and Bf 110s made up the bulk of the night fighter force, Dornier persevered and with the J-1s relegated to training it delivered the Lichtenstein radar-equipped Do 217J-2 for service from early-1943. This proved marginally better but it was still too heavy and with the radar antenna cutting the speed down to less than an RAF Halifax bomber, it had limited success. The Do 217J night fighter was based on the Do 217E bomber. It differed from the bomber in that its crew was reduced to three people and its fixed firepower was strengthened. The first prototype, the Do 217J V1, was converted from the Do 217 E-1 and underwent tests in late 1941. They started to deliver the Do 217 J-1 to the Luftwaffe's fighting troops in the spring of 1942. Just like the Do 217 E-2, this plane was equipped with two BMW 801 ML fourteen-cylinder, air-cooled engines with a takeoff power of 1,580 hp. The plane's offensive armament consisted of four 20 mm Oerlikon MG FF/M cannons (drum-fed, with 240 rounds each) and four 7.92 mm Rheinmetall-Borsig MG 17 machine guns (with 700 rounds each) located in the forward fuselage. The defensive armament included two 13 mm Rheinmetall-Borsig MG 131 machine guns. One of them was installed in an upper DL 131/1A electric turret (500 rounds of ammo), and the second one was located in a lower WL 131/1 turret (1,000 rounds of ammo). Production Do 217 J-1s had no radar and were equipped only with Spanner-Anlage infra-red detection systems. There was an extra 1,160-litre fuel tank in the forward bomb bay, and the rear bay could hold eight 50 kg aerial bombs in suspension, if the aircraft was to be used as a «night hunter» to strike enemy airfields. The Do 217 J-1 was the heaviest night fighter in the Luftwaffe's arsenal. In this capacity, the aircraft had only modest speed (even lower than the Do 217E that it had been based on) and manoeuvrability. Its high landing speed ruled out multiple airfields as options for the plane's base. A combined total of 130 Do 217 J-1 variant aircraft were built. Some of them were subsequently converted to the Do 217 J-2 when a radar station was installed. In addition to the Luftwaffe, Do 217 J-1s were also operated in Italy. A total of 12 Do 217 J-1 night fighters were received by the Regia Aeronautica in early 1943 to enter service with 235a Squadriglia, 60° Gruppo. The crews of these Italian night fighters never achieved any noteworthy successes. They chalked up only one air victory when they brought down a British Lancaster bomber on the night of July 16, 1943.